I have always had a love for animals growing up and always had a house full of animals. I currently have two Golden Retrievers and two cats fur babies, but there are always a few feral cats on my property that I have worked with to get them vaccinated, spayed or neutered, and worked to get them a little more people friendly. 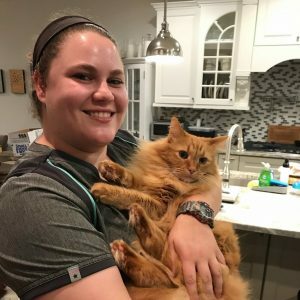 I graduated from Hillsborough High School in 2012 and went to Fairleigh Dickinson University to originally study to become a human ultrasound technician, but decided that I wanted to be able help animals, so I left North Jersey to start studying with Penn Foster to get my veterinary technician certification. In my spare time I volunteer coach volleyball at Princeton High School where I help teach the girl all that I know to help their new team continue to grow. I played volleyball in high school, on club teams and even while I spent my short time at Fairleigh Dickinson University. Before joining the House Paws team I worked at Camp Bow Wow where I got to meet all the doctors and technicians and enjoyed working with everyone even if it was just for those few sick visits. I look forward to growing as a veterinary Technician with House Paws and helping as many pets as I can.